With this plugin you can add extra HTML or just plain text when posting a new page or post. That content will be displayed in sidebar widget. Good for inserting related links or other content into it. You can download it from wordpress plugin directory. This is my first plugin for wordpress so it is maybe little messy and not so wisely coded. I take no responsibility for this plugin. Use it at your own risk. Anyway it creates a new table in database for this content, so you don’t need to worry about data loss or something. Plugin only saves data into it's own table. I created it september 2008 and have maintained it since. Installation is very easy. After activating this plugin you can add ax-sidebar data into post. No extra configuration needed- only add widget to sidebar and you are good to go. 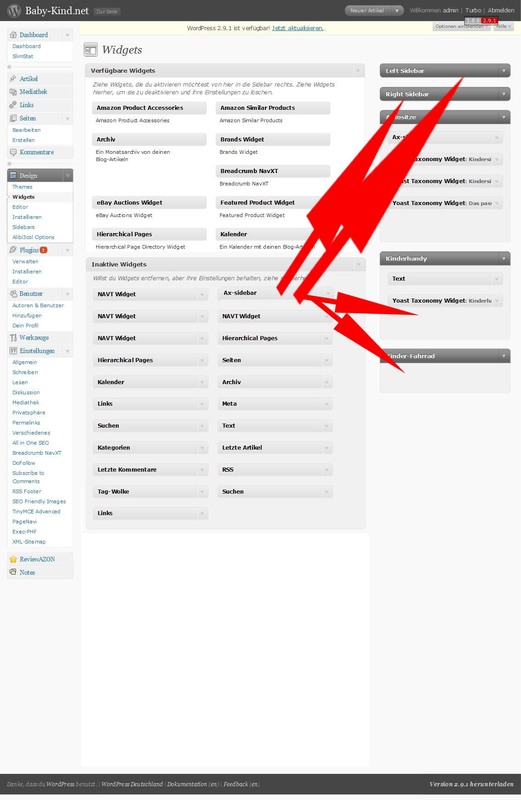 Note that it needs CREATE permissions for mysql user wich wordpress uses. It's only tested since wordpress 2.6 so I really don't know does it work in previous versions. Maybe I will develop it further, so feel free post me a comment or feature request if you want. I haven't tested this yet but it looks really cool. It is one of things I would never have thought to do but could be quite useful. Really creative there. does not work on wordpress 2.6... i installed wordpress 2.5.2 but there is no version of wordpress 2.5.3 ? Istari, Maybe your database user used for WP does not have CREATE permissions. This is important because this plugin creates new table into database. My both blogs are at version 2.6 and this plugin works. About other versions I really dont know, and it is mentioned above. Great plugin. But is it possible to call axe sidebar manually on wordpress instead of having widget? On some posts I have different theme which doesn't have sidebars and no widget is active on it. In fact, I don’t know. I've no time to test it right now. But If you gonna change your theme anyway (as I can understand) why not add widget area for that as well. It should be easy, if I can remember right. thanks for this cool plugin, great work :) thanks in advance. Hi Norbert, Actually I could add more widgets that can be added to theme, but I don’t know when I will have time for that modification. Not in this year for sure. Maybe next year’s first week. But good to hear this plugin is helpful. This sure is inspiring. Nice plugin! Works a treat! Keep up the good work! Great thing, thanks a lot! 1) Does not store info until published (erases from draft pages and sometimes when updates are made). Please advise if this is a known issue or if fixes are planned. Thanks for the plugin! I fixed bug wich removed ax-sidebar content when post quick-edit was used in wordpress. New update tagged as version 1.31. Other problem seems to be related? Have to investigate it some time. Installed the latest version and it's all fixed. Both issues. Thank you SO much for the great plugin! Great plugin. What would be the easiest way to make the sidebar automatically scroll? Is there a way to include the tag cloud php in the ax sidebar? 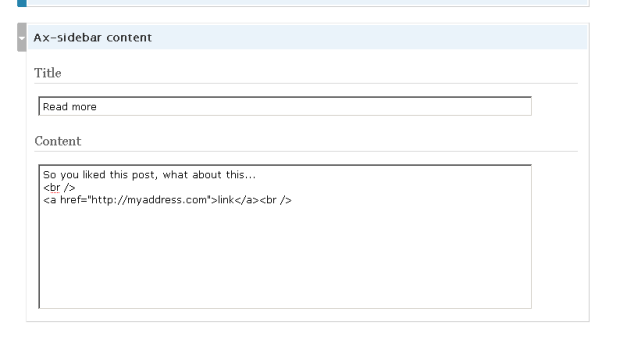 I tried inserting the php tag but it does not render a dynamic sidebar with this in the content section. PHP code/tags don't work in ax-sidebar. 2) shortcode support! Its an outstanding widget other than that! I have searched for hours investigating various plugins to accomplish what this one does. A few came close but had FAR more complexity than this one. This tool is awesome! The fact that this plugin will work with BOTH Posts and Pages is worth it's weight in gold! Do you have Donation button somewhere on your site? You have saved me effort and streamlined my workflow!! I am all of a sudden experiencing an issue where Posts that I had previously input the text for display in the Ax-Sidebar Content area is not displaying. At first I thought that the plugin only worked on Posts that were created after I installed your plugin...but I don't think so. I am using WP 3.3 and your newest download. Well in one day I have gone from one extreme to the next as far as using your plugin is concerned. Yesterday everything ran perfectly! But not today. I have reviewed all of my information...and everything is solid...I even checked the Ax sidebar database table to make sure everything was being stored, it's all there. Can you help me out as to what may have happened? I even went back to a previous backup where everything worked perfectly...no success! Also, during testing, I noticed each time I updated my Post that had your plugin attached to it...the database had a new record written to it...not sure why..? Wouldn't that really begin to overload my database table if I end up inputting hundreds of Posts that need updates performed? I am creating an eCommerce site where I need to use Posts to display my photos on the entrance pages (that's how the theme I use built things)...so they act as the enticement for customers to check out my photography store. Once in the store the eCommerce program handles all of it's products independently of everything. Problem is...I will need to "pull the plug" on your program if what ever is wrong is not user error! I need reliability. This plugin has huge potential! I do not mean to sound like I have an attitude but just need to let you know what is happening...I REALLY want this to work out! First- thank you for your feedback. I tried this plugin @ WP 3.3 now, and it seemed to work. Tested some various scenarios of updating. So there should be no problem with newer WP than plugin officially supports. Plugin has to make for every update a record, because it's revision. If you look at your posts table- there are also new record created for each update. But now I found a bug in my plugin. If I restore some old revision, my plugin contents does not change. Always shows last content. One is sure- I have to update my plugin but I don't know what could be your specific problem. I have to recommend some other solution if I don't find obvious reason for that behaviour. I've been using the AX Sidebar Content plugin again on a new client's site with WP 3.2.1. Works very well and I am not running into the problems that Ted is experiencing, but I did hit on something else. I have a static home page for this site and when the page_id or pretty permalink is not called explicitly, the content does not appear. For instance, domain.com/?page_id=1, set as the homepage, would show the content but domain.com would not. Any thoughts on why this may be occurring? Thank you for sharing the plugin. I'm using WP 3.3.1 and it does anything I want. A great improvement would be to be able to apply it to more than one sidebar. My websites in particular have several sidebars for various post types and I would really like to be able to add different content to them on a by post basis. Still awaiting feedback from the issue noted a few months ago. 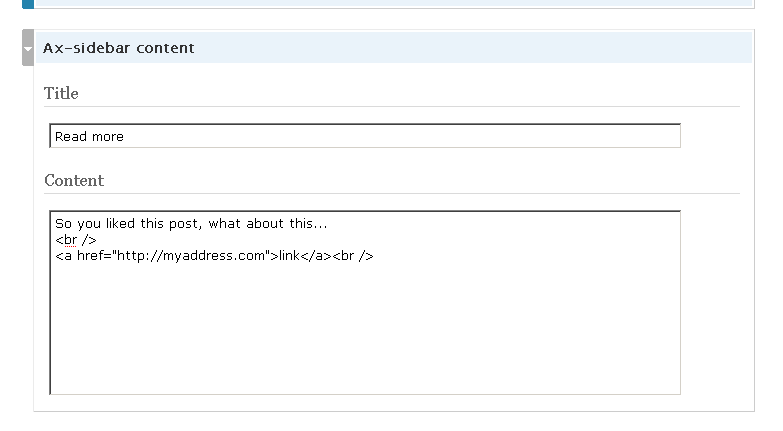 I am unable to resolve this short of editing the htaccess to redirect to a pretty permalinked page. Copied below. My answer is late but, I might be looking into that anytime soon. I am doing some updates to this plugin and maybe I will add some extra widgets also while at it. I don't understand what is exactly the setup causing your problem, but it seems to be pretty not-usual. It needs some debugging probably what variables are aivable and what are not for plugin. It does not show contents if it does not get page/post ID. That's great, Janar. The plugin is so useful that the facility to use it on more than one sidebar will be fantastic. I'm in need of that right now. Looking forward to the update also. The issue is certainly not unique in that many people use a static front page on their WordPress site. When you do so and enter only the main domain address (not /?page_id= or permalink URI), the sidebar content does not show up. I am guessing that this is because the URI is not showing the page ID and therefore the sidebar, which does not allow for a null parent_id, does not get triggered. However, I would think that if the content is being called from the parent_id wp_posts entry, it would also call the sidebar content.